Learn about using the Compliance XQuery Policy to execute an XQuery statement on a service or message model to determine compliance. XQuery is a query language that queries and transforms collections of structured and unstructured data, usually XML. XPath is a subset of XQuery. 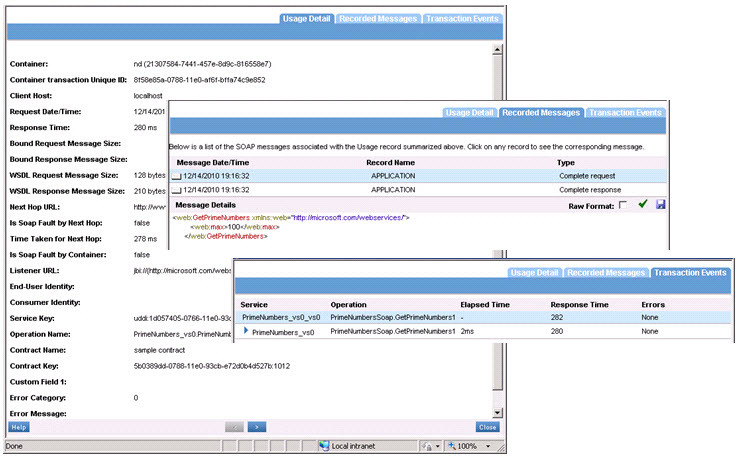 The Compliance XQuery policy executes an XQuery statement on the service or message model to determine compliance. 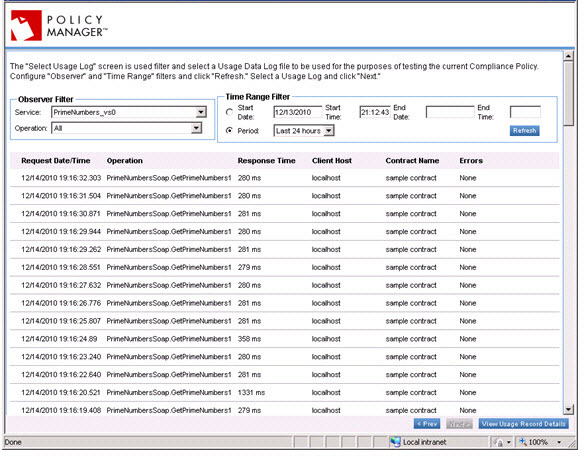 Find the policy on the list and click to go to the pane for the Compliance XQuery policy. In the second section, click Modify. The Modify Compliance XQuery Policy page opens, as shown below. Choose an asset type. For information on the individual options, see Compliance XQuery Policy Options below. When the Query Builder pane is populated, choose elements that you want to include in your Compliance XQuery policy. Use the arrow buttons to copy elements to the Namespace Declarations and/or XQuery fields. Click Evaluate to test the information, and debug as needed. When done, click Finish. The policy definition is saved. The Modify Compliance XQuery Policy wizard includes the options listed below. For instructions, see Populating an XQuery policy with schema or WSDL data. For instructions, see Populating an XQuery policy with service data. For instructions, see Populating an XQuery policy with exchange (message) data. The tree hierarchy stores the asset information that you specify for the current policy definition. You can populate it with any one of the four asset types (message, schema, service, or WSDL). When you choose the asset type, define the source, and click Load Context, the tree hierarchy is populated with the content. After the tree hierarchy is populated, you can select Namespace Declarations and XQuery expressions and transfer them to the target text boxes (Namespace Declarations and XQuery) by clicking the arrow buttons. Exchange—Displays the Select Usage Log screen which allows you to search for a usage log to upload into the tree hierarchy of the Query Builder. See Populating an XQuery policy with exchange (message) data. Schema—Displays the Upload File screen which allows you to upload a schema into the tree hierarchy of the Query Builder. See Populating an XQuery policy with schema or WSDL data. Service—Displays the Upload Service screen which allows you to navigate a tree hierarchy and select a service to be uploaded tree hierarchy of the Query Builder. See Populating an XQuery policy with service data. WSDL—Displays the Upload File screen which allows you to upload a WSDL into the tree hierarchy of the Query Builder. See Populating an XQuery policy with schema or WSDL data. This provides namespace prefix resolution for the XQuery statement, effectively decoupling the XQuery statement from literal namespace prefixes. The XQuery text box must contain the comp context (compCtx:) for the selected asset. Evaluates the XQuery statement against the current context, and displays the results in the associated text box. Note that the Query Builder implementation is for advanced users and requires a working knowledge of XPath/XQuery. Specify the warning message to be displayed if the XQuery statement evaluates to a warning (#4 above). Specify the error message to be displayed if the XQuery statement evaluates to an error (#5 above). To populate a XQuery Policy with schema or WSDL data, you'll need to upload the applicable file. From the Asset Type list, select schema or wsdl, and then click Load Context. The Upload File page is displayed, as shown below. 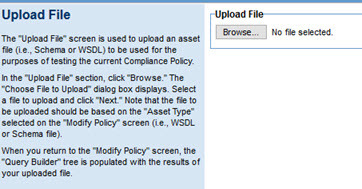 Upload the asset file (schema or WSDL) to be used for testing the current compliance policy. Make sure you upload the correct file type, according to the asset type you specified. The Query Builder tree is populated with the file you uploaded. 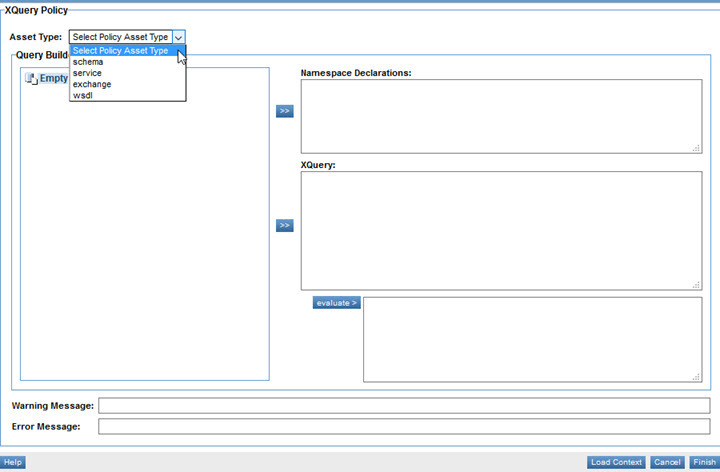 To populate a XQuery Policy with service data, choose an Asset Type of service and then click Load Context. The Select Policy Asset page is displayed, as shown below. Here, you can upload an asset file (Service) to be used for testing the compliance policy. Navigate the tree hierarchy, choose a service, and click Next. 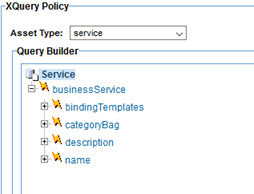 You are returned to the Modify Policy page, and the service information is displayed in the Query Builder tree, as shown below. You can now configure the policy further based on the service you selected, following the steps in To configure a Compliance XQuery policy (Step 6 onwards). To populate the policy with message data, choose Exchange from the Asset Type list, and then click Load Context. The Select Usage Log screen is displayed. On this page, you can filter usage data, as shown below. Choose a service/operation combination and specify a time range filter. Configure the Observer Filter and Time Range Filter and then click Refresh. After completing the search, choose the usage logs you would like to use to populate the Query Builder, and then click Next to go to the Modify XQuery Policy page. To view details for selected usage records, select a usage data report line item and click View Usage Record Details. The Usage Record Details screen displays with a list of usage data fields and associated SOAP messages. The Usage Detail tab allows you to navigate the list of SOAP messages associated with the current usage record. To navigate to the next SOAP message, click Next or Previous. The Recorded Message section displays SOAP messages associated with the usage record of the current service. To view the message details for the current SOAP message, just click the line item. To view message details in XML format, choose Raw Format. To save the selected SOAP message, click Save. To view the usage detail for a transaction, just double-click the line item. An example is shown below. The example below combines the display of all three tabs.